Written specifically for Edexcel's Component 3, Section A, this A5 revision booklet is the perfect resource for your students in the lead up to the exam. A firm favourite in the EHD office, Dennis Kelly's DNA has proved extremely popular with many of you over the years so we are anticipating that this new addition to our range will fly off the shelves. 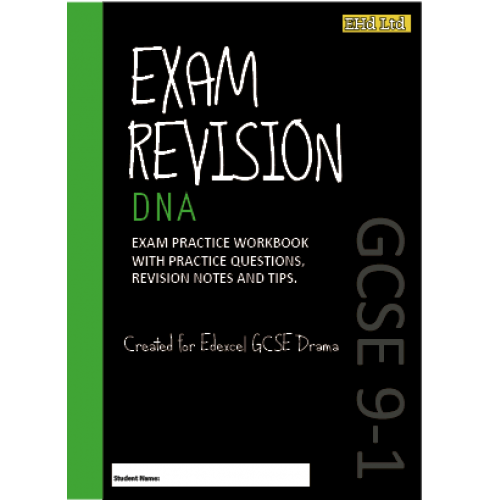 Many of you have told us that you're looking for a revision booklet for DNA, which is low cost and allows students to work independently through detailed revision tasks. Well we think that our writers have fulfilled this brief and then some! This A5 student booklet is structured around key extracts from the play. For each extract, students are provided with many exam-style questions (covering 4-mark, 6-mark, 9-mark, 12-mark and 14-mark questions). These are written so that students will become accustomed to the type of questions they will be faced with on exam day, covering question types from a performer, director and designer perspective. Students are provided with a clear breakdown of the question brief, detailed revision notes, sample responses, explanations of the mark scheme, examiner-style comments and tips for success. There are also pages within the book which allow students to attempt their own responses, using all the guidance they have been given. By working through the book in its entirety, students will have covered all types of questions they are likely to be faced with on exam day. They will have carried out thorough revision of key extracts from all acts of the play, have revised key characters (such as Phil, Richard, Leah, Danny, John and Cathy) revised key quotes, themes and messages of the play, have explored aspects of performance skills, directorial ideas and design aspects, have an excellent grasp of the key aspects of the mark scheme, understand what they have to do to achieve high marks on all types of questions and be equipped with many techniques for breaking down a question and structuring their answer. This booklet can be used within class but its real strength comes from the fact that it has been written for students to use independently. You could give a copy to each of your students (and we've even priced it to enable you to purchase a class set, or even for your students to buy themselves a copy) and send them off to revise, knowing that the booklet is self-explanatory and covers all the revision areas necessary for exam success.